This beautiful book features over 250 color photos from the Mendonoma Coast, the vast majority taken by nature photographer Craig Tooley. 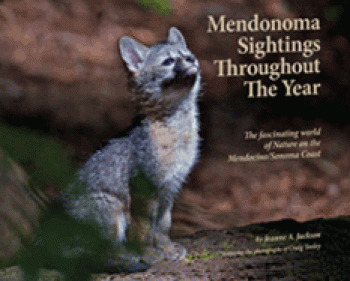 Jeanne writes a weekly column, Mendonoma Sightings, in the Independent Coast Observer, which has appeared for more than eight years. This book is a compilation of her work in the Independent Coast Observer. Her book is filled with wildlife encounters, fun facts and, perhaps most important, what you can hope or expect to see each month of the year, from the tiniest wildflower blooming in a forest to the largest creature on earth, the Blue Whale.